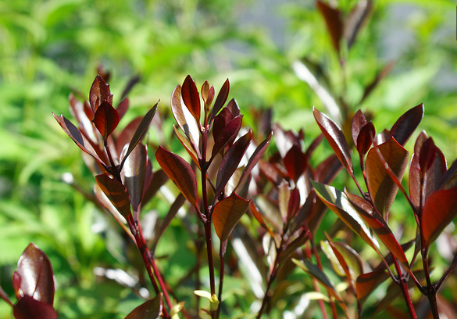 Remarkable form of the holly leaf tea olive with new growth that emerges a deep purple black. It settles to dark green in summer on a large growing shrub to 8′ x 8′ in 7 years. Full sun to very light shade in all soils that drain well. Very drought adapted when established. Mature shrubs bear masses of tiny white flowers in the leaf axils in October-November that cast a sweet perfume. Excellent cold hardiness. This is one of the few broad leaf evergreens that is perfectly hardy to the subfreezing wind of the gorge. Troutdale, this shrubs for you. Great hedge as well as specimen. Flowers occur on wood from the previous year- prune in winter after flowering.